Rosito Ruas, a high school teacher from Ossu visited Willoughby for 3 weeks via a Teacher Exchange Scholarship in May 2017. Thanks to a Chatswood RSL ClubGRANT Rosito had the opportunity to visit and interact with local Willoughby high schools to learn new teaching methods and share his culture with students. Provided medical supplies such as stethoscopes and baby scales to the local health clinic in Ossu and to the main hospital in Dili. Promoted and funded English and Portuguese classes in Ossu for local people and teachers. With assistance from Engineers Without Borders TL, WaterAid International, we funded an extensive assessment into the access to water, sanitation and hygiene (WASH) in Ossu town. From this report, we developed a plan of action and strategy to bring clean water to the entire village of Ossu over the next 3 years. Together with Mary MacKillop International, we were able to deliver two Literacy Training Workshops and one Music Education Workshop for 90 teachers in the Ossu sub-district. Donated 30 musical kits (xylophone, triangles) for the Health Music Education Workshops conducted by local teachers trained by Mary MacKillop International. WFOO Committee members visited Ossu in 2015, 2016 and 2017 to foster friendship and support. We have funded youth programs to provide music, art and sport training. 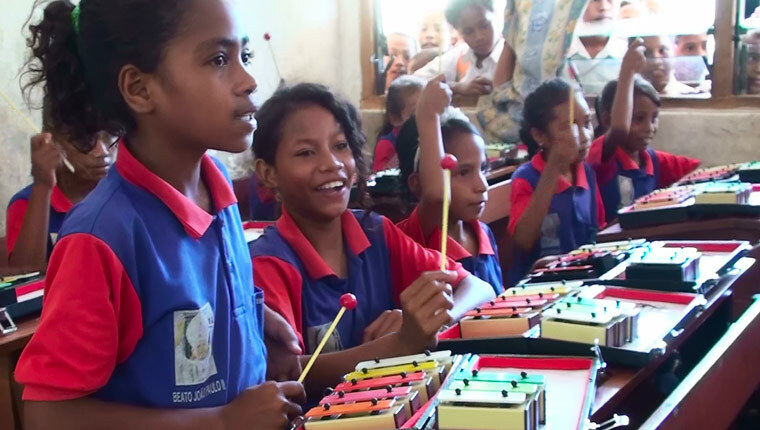 This video shows a music class in Timor-Leste led by Antonio of Mary MacKillop Today working with Willoughby Friends of Ossu. In Ossu there is very limited electric power. People cook over open fires, and the smoke is causing major health problems for women and children – diseases of the lungs and neurological problems. There’s a very good solution: clean-burning kitchen stoves. WFOO is investigating the introduction of these to Ossu as part of an emerging worldwide movement to improve the lives of the world’s poor. By reducing the amount of firewood used, cookstoves will also help preserve East Timor’s forests. Improved stoves can cut fuel use by 40% while reducing harmful pollution. The video shows how clean cook stoves are being introduced to save forests and improve family health. The soil in most of East Timor is poor and worked out. Crop yields are low, and farmers lack the money to import fertiliser. In consultation with Ossu’s farmers, WFOO is planning to introduce new methods to improve soil fertility from local resources. The Biochar method involves the making of charcoal to be added to the soil. The charcoal is produced at the village level by burning vegetable and animal waste in a low oxygen kiln. Biochar retains soil moisture, helps soil microbes to grow, and builds up nitrogen and minerals. Biochar is an emerging science under trial in a number of developing countries. Employed a local Timorese person as the project coordinator. Repaired and restored the building “Uma Maun Alin” (Friendship House) with a focus on the local community needs. Hosted 7 artists from the Arte Morris Art School, Timor-Leste to study and exhibit at the Workshop Art Centre in Willoughby. Hosted the Timorese Woven Women’s Workshop to promote the culture and economic independence of the women of Timor-Leste. Hosted events for members of the World Youth Day representatives from Ossu. Sent delegates to Friendship Conference in Dili, Timor-Leste, June 2008. Greening of Ossu environment with 150 trees planted by school students. With Rotary we distributed reconditioned computers and printers. Delivered computer classes and English lessons. Repaired water pipes to assist over 500 villagers. Provided sports equipment and team uniforms for soccer and basketball. Provided ongoing funding for Seeds of Life field study research and planting of rice and sweet potato in Ossu. Former Willoughby City Council employees participated in a cycling event. Andrew James and Liz Drummond summoned enormous courage to complete the ‘Tour de Timor’ event over 6 days during September 2011. They also visited Ossu. Andrew James constructed a trial biochar oven and later it was delivered to Ossu for training. Please watch the video to see how we raise funds for the people of Timor-Leste.